Download the free Common Threads 2015 PDF here, or purchase the hard copy (which helps fund Mass Poetry programming) here for $10. 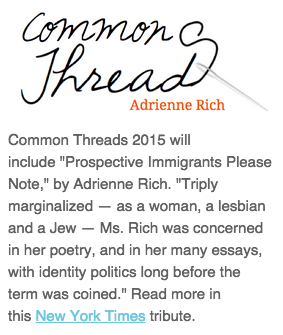 Our "Get to know..." selections for the 2015 Common Threads poets, which were included in newsletters leading up to the Common Threads release. 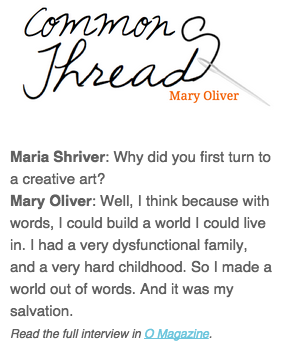 Click on a quote to read the entire article or interview! We have tried to list books of poetry only, though several of these poets have published prose as well. Please note that these lists may be incomplete, but we hope they might be a starting point for perusal of our 2015 Common Threads poets' work. · Vesper Sparrows, Atheneum (New York, NY), 1986. · Late in the Millennium, Knopf (New York, NY), 1989. · Rough Music, Knopf, 1995. · The Wind Blows through the Doors of my Heart, Random House (New York, NY), 2010. · No Voyage, and Other Poems, Dent (New York, NY), 1963, expanded edition, Houghton Mifflin (Boston, MA), 1965. · The River Styx, Ohio, and Other Poems, Harcourt (New York, NY), 1972. · The Night Traveler, Bits Press, 1978. · Twelve Moons, Little, Brown (Boston, MA), 1978. · Sleeping in the Forest, Ohio Review Chapbook, 1979. · American Primitive, Little, Brown (Boston, MA), 1983. · Dream Work, Atlantic Monthly Press (Boston, MA), 1986. · Provincetown, Appletree Alley, 1987. · House of Light, Beacon Press (Boston, MA), 1990. · New and Selected Poems, Beacon Press (Boston, MA), 1992. · White Pine: Poems and Prose Poems, Harcourt (San Diego, CA), 1994. · Blue Pastures, Harcourt (New York, NY), 1995. · West Wind: Poems and Prose Poems, Houghton Mifflin (Boston, MA), 1997. · Winter Hours: Prose, Prose Poems, and Poems, Houghton Mifflin (Boston, MA), 1999. · The Leaf and the Cloud, Da Capo (Cambridge, MA), 2000. · What Do We Know, Da Capo (Cambridge, MA), 2002. · Why I Wake Early, Beacon (Boston, MA), 2004. · Boston Iris: Poems and Essays, Beacon (Boston, MA), 2004. · New and Selected Poems, Volume Two, Beacon (Boston, MA), 2004. · Thirst: Poems, Beacon (Boston, MA), 2006. · Our World, (with photographer Molly Malone), Beacon (Boston, MA), 2007. · Red Bird, Beacon (Boston, MA), 2008. · Evidence, Beacon (Boston, MA), 2009. · Swan: Poems and Prose Poems, Beacon (Boston, MA), 2010. · A Change of World, with foreword by W.H. Auden, Yale University Press (New Haven, CT), 1951. · Poems, Oxford University Poetry Society (New York, NY), 1952. · The Diamond Cutters and Other Poems, Harper (New York, NY), 1955. · Necessities of Life, Norton (New York, NY), 1966. · Selected Poems, Chatto & Windus (London, England), 1967. · Leaflets: Poems, 1965-1968, Norton (New York, NY), 1969. · The Will to Change: Poems, 1968-1970, Norton (New York, NY), 1971. · Diving into the Wreck: Poems, 1971-1972, Norton (New York, NY), 1973. · Poems: Selected and New, 1950-1974, Norton (New York, NY), 1974. · Twenty-one Love Poems, Effie's Press (Emeryville, CA), 1977. · The Dream of a Common Language: Poems, 1974-1977, Norton (New York, NY), 1978. · A Wild Patience Has Taken Me This Far: Poems, 1978-1981, Norton (New York, NY), 1981. · Sources, Heyeck Press (Woodside, CA), 1983. · The Fact of a Doorframe: Poems Selected and New, 1950-1984, Norton (New York, NY), 1984. · Your Native Land, Your Life, Norton (New York, NY), 1986. · Time's Power: Poems, 1985-1988, Norton (New York, NY), 1988. · An Atlas of the Difficult World: Poems, 1988-1991, Norton (New York, NY), 1991. · Collected Early Poems, 1950-1970, Norton (New York, NY), 1993. · Dark Fields of the Republic, 1991-1995, Norton (New York, NY), 1995. · Selected Poems, 1950-1995, Salmon Publishers (Knockeven, Ireland), 1996. · Midnight Salvage: Poems, 1995-1998, Norton (New York, NY), 1999. · Fox: Poems, 1998-2000, Norton (New York, NY), 2001. · The School among the Ruins: Poems, 2000-2004, Norton (New York, NY), 2004. · Telephone Ringing in the Labyrinth: Poems 2004-2006, Norton (New York, NY), 2007. · 25 Poems, Guardian Commercial Printery (Port-of-Spain, Trinidad), 1948. · Epitaph for the Young: XII Cantos, Barbados Advocate (Bridgetown, Barbados), 1949. · Poems, Kingston City Printery (Kingston, Jamaica), 1953. · Selected Poems, Farrar, Straus (New York, NY), 1964. · The Castaway, J. Cape (London, England), 1965. Poems, Farrar, Straus (New York, NY), 1970.
selected bibliography by Robert D. Hammer, Three Continents Press (Washington, DC), 1982. · Sea Grapes, Farrar, Straus (New York, NY), 1976. · Selected Verse, Heinemann (London, England), 1976. · The Star-Apple Kingdom, Farrar, Straus (New York, NY), 1979. · The Fortunate Traveller, Farrar, Straus (New York, NY), 1981. · Selected Poetry, selected, annotated, and introduced by Wayne Brown, Heinemann (London, England), 1981, revised edition, 1993. · The Caribbean Poetry of Derek Walcott and the Art of Romare Beardon, Limited Editions Club (New York, NY), 1983. · Midsummer, Farrar, Straus (New York, NY), 1984. · Collected Poems, 1948-1984, Farrar, Straus (New York, NY), 1986. · The Arkansas Testament, Farrar, Straus (New York, NY), 1987. · Omeros, Farrar, Straus (New York, NY), 1990. · Collected Poems, Faber (London, England), 1990. · Poems, 1965-1980, J. Cape (London, England), 1992. · Derek Walcott: Selected Poems, Longman (London, England), 1993. · The Bounty, Farrar, Straus (New York, NY), 1997. · Tiepolo's Hound, Farrar, Straus (New York, NY), 2000. · The Prodigal (book-length poem), Farrar, Straus (New York, NY), 2004. · Selected Poems, Farrar, Straus (New York, NY), 2007. · White Egrets, Farrar, Straus (New York, NY), 2010. · The Beautiful Changes and Other Poems, Reynal, 1947. · Ceremony and Other Poems, Harcourt (Boston), 1950. · Things of This World: Poems, Harcourt, 1956. · Poems, 1943-1956, Faber (London), 1957. · Advice to a Prophet, and Other Poems, 1961. · The Poems of Richard Wilbur, Harcourt, 1963. · Walking to Sleep: New Poems and Translations, Harcourt, 1969. · Seed Leaves: Homage to R. F. (poem), limited edition, David R. Godine, 1974. · The Mind-Reader: New Poems, Harcourt, 1976. · Seven Poems, Abbatoir Editions, 1981. · New and Collected Poems, Harcourt, 1988. · Mayflies: New Poems and Translations, Harcourt (New York City), 2000. · Collected Poems: 1943-2004, Harcourt (San Diego, CA), 2004.